After shooting Phosphorescent, it was time once again to head over to the Mane stage for Steel Magnolia, the duo of Meghan Linsey and Joshua Scott Jones. These two really looked like they were having a good time. 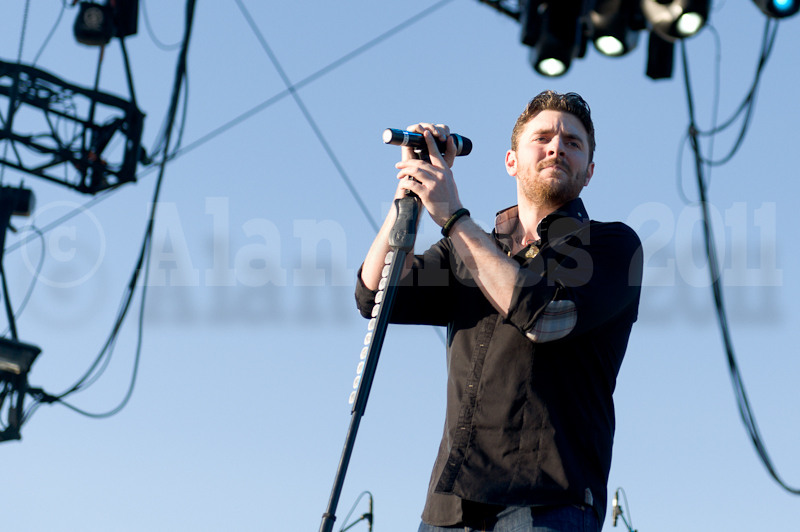 As for the photography, it was pretty standard for an afternoon set where the stage was lit by direct sunlight. Because of the logistics of the stages and the lack of communication to the security, I had to exit the Mane stage area on stage right and try to make it around the rear of the crowd to get to the Palomino stage for the Secret Sister show which I ended up missing. The frustration I felt art this got worse when I realized that I actually needed to get back to the Mane stage for Chris Young. After the first three songs I headed over to the Palomino stage to try to get a few shots of Rodney Crowell and while I didn’t make it in time to shoot the whole set, I did manage to get a few good shots in at the end of his third song. Then came the biggest twist of the day, Junior Brown was playing a day early. He was not on the schedule for Saturday but he was there, playing. Then it was time to head over to the Mane stage one more time. This time it was to photograph Darius Rucker as the sun started to set over Indio. This made the lighting tough. For some reason, the lighting director for this show decided not to have any follow spots on Darius and instead washed the stage in predominately red. Then came one of the most surprising photo opportunity of the night, if not the whole festival; Mel Tillis. I headed over to Palomino stage to catch both Mel Tillis and then Kris Kristofferson. Shooting Mel Tillis was great. The man is a legend, and a great story-teller. He is one of those artists that seems to forge a bond with his audience from the minute he hit the stage. The great thing about being at the Mel Tillis set was watching him introduce his good friend and the next performer, Kris Kristofferson. The day was nearly over and it was time to head back to the Mane stage to shoot the Kenny Chesney, the closing act for day 1 at Stagecoach. This shoot was not from the photo pit but instead we were to shoot from the front of the soundboard. This was pretty far away and I was really happy that I had the Nikkor 300mm f/4 lens with me to get a little more reach, but even that lens would have a hard time at these distances.